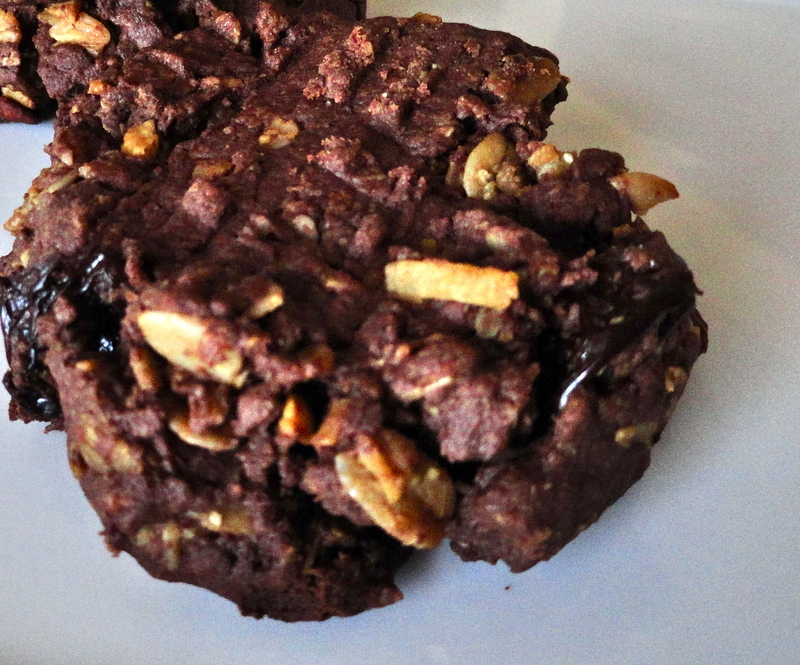 3 Ingredient Chocolate Peanut Butter Cookies! I’ve finally gotten around to reading my September issue of Food and Wine (thanks to a little work trip to Milwaukee), and there was an entire section of three ingredient recipes (salt, pepper and oil were not included as ingredients). There is nothing I love more than a great recipe with limited ingredients, so I picked out a handful of recipes to add to my “to try” pile. 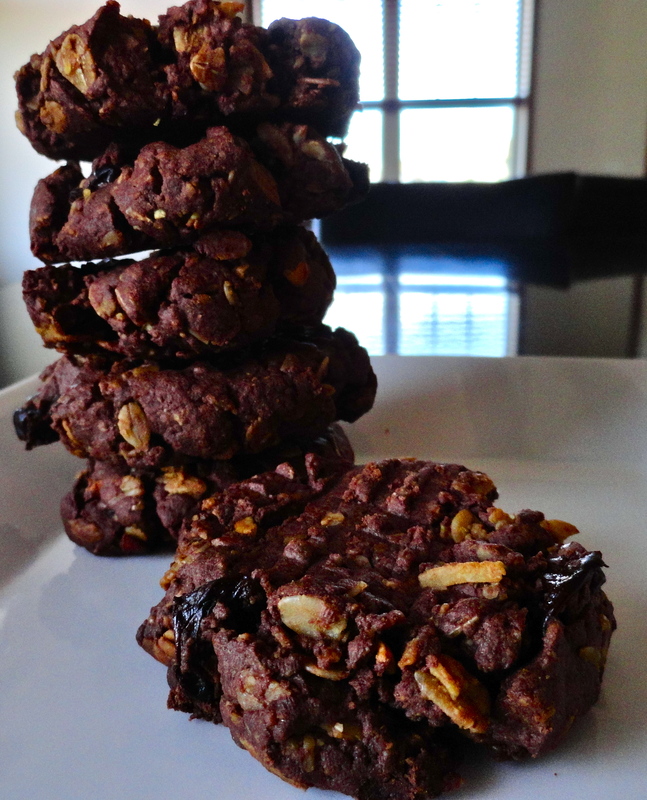 The first one I just had to try was Chocolate Peanut Butter Granola Cookies. What kind of cookie has only three ingredients? This one. My local grocery store didn’t have chocolate peanut butter, only hazelnut butter – not the same. I stopped at my local super center, and they even had the brand recommended by Food and Wine. Score! I also grabbed some granola with dried cherries from the bulk bins. Food and Wine has never steered me in the wrong direction with recipes, but I was a little concerned that the cookies wouldn’t be sweet enough, and almost added sugar to the cookie dough. I didn’t. But, I sorta wish I did. The cookies turned out really good, but they are more bitter than sweet. They taste good, but I do think they could be a bit sweeter. A sweeter granola would work as well. **Edit: After having them on hand for a few days, I actually really love these cookies. They are a great dose of chocolate, and I am LOVING the dried cherries (fruit that was in my granola). I highly recommend these! 1. Preheat oven to 350 degrees and line two baking sheets with parchment paper. Add one cup of the granola into a medium bowl. From the remaining cup of granola, pick out the fruit and add to the first bowl. Add the granola without fruit to a food processor and pulse until finely ground. 2. In the bowl of a stand mixer, add ground granola, peanut butter, egg, and salt. Beat at a low-speed until smooth. Add the remaining granola and fruit and mix until just combined. 3. Form the cookie dough into 1 inch balls and place them on a baking sheet. Flatten the balls with the tines of a fork. Bake for until cookies are browned around the edges, about 15 minutes. Let cookies cool completely on baking sheet. Cookies can be stored in an airtight container for up to 3 days. Success and fails, I'm documenting my cooking and baking adventures. I enjoy making healthy, exciting, and generally simple food, although I may stray from time to time. I'm also a beginner brewer, so I'll share my beer triumphs and tribulations as well.